Rupert Bawden was born in London in 1958. After leaving Cambridge University, where he studied composition with Robin Holloway, he embarked on a varied musical career as a performer, composer and conductor. 1991 saw the completion of his first stage work, the ballet Le Livre de Fauvel, commissioned by the City of Munich for the Bavarian State Ballet. Much of the previous five years' work could be seen as a preparation for this project:, explicitly in the shape of an earlier and much shorter piece of the same title (now renamed Three Scenes) first performed at the 1986 Aldeburgh Festival, or in Souvenirs de Fauvel of 1987, for two pianos. A more tangential relationship exists with the pair of works premiered in 1989, Dramatic Cantata on the Legend of Apollo and Daphne and the barcarolle Ultima Scena. Meanwhile the pieces Wanderjahr and The Devil's Workshop, both composed in 1990, have signalled a new stylistic direction and set of influences at work. In 1992, in response to a commission from the BBC, Rupert Bawden wrote Two Choruses for SATB, harp and string orchestra. In 1993, again in response to a BBC commission, he wrote The Days of the Hawk, a setting of text by Ali Ahmad Sa'id translated by John Asfour, for choir and orchestra. Both Two Choruses and The Days of the Hawk were premiered by the BBC Singers and the BBC Symphony Orchestra at the BBC Studios Maida Vale, in October 1993, with the composer conducting. In 1992, The Almeida Opera commissioned Morike-Lieder - a setting of texts by Eduard Morike for soprano, harp and four cellos. In 1994 the St. Asaph Festival commissioned two orchestral pieces from Rupert Bawden, the Two Studies and The Road of Mirrors. Both works were premiered at the 1994 St. Asaph Festival, again with the composer conducting. The notable piano part featured in The Road of Mirrors was played in this first performance by Richard Rodney Bennett. In parallel with his activities as a composer, Rupert Bawden has worked extensively as a performer. A violinist and a viola player he has taken part in concerts and recordings across the stylistic spectrum: as well as contemporary music he has been involved in the early music movement. As a conductor, he has appeared with the BBC Symphony and the Scottish Chamber Orchestra, the Northern Sinfonia, London Sinfonietta, Nash, Almeida and Endymion Ensembles since his professional debut in 1986. He has conducted operas by Henze and Michael Nyman, and, for the BBC, stagings of works by Gruber (Frankenstein) and Kagel (Oral Treason). 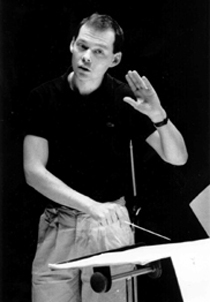 He also conducted the BBC Symphony Orchestra in David Sawer's Sony Award-winning Swansong.